Magma Kirby is a new ability that appears on KAA and KTCG. 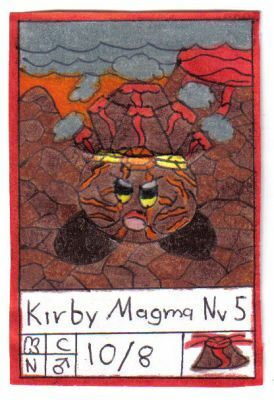 With this ability kirby is capable to create poweful attacks with the power of the interior of the Earth, "The Magma", this ability is more poweful than the Fire ability, this ability is one of the abilities that are very hard to get because the enemies of this abilities are very rare that they appear in the worlds or is very hard to absorb them. When kirby gets the magma power he can use it in a form of ball, shoot, flames, meteors or can create a great eruption. Pressure Up, Magma Ball, Magma Wave, Pyroclasts Breath, Ash Ball, among others.